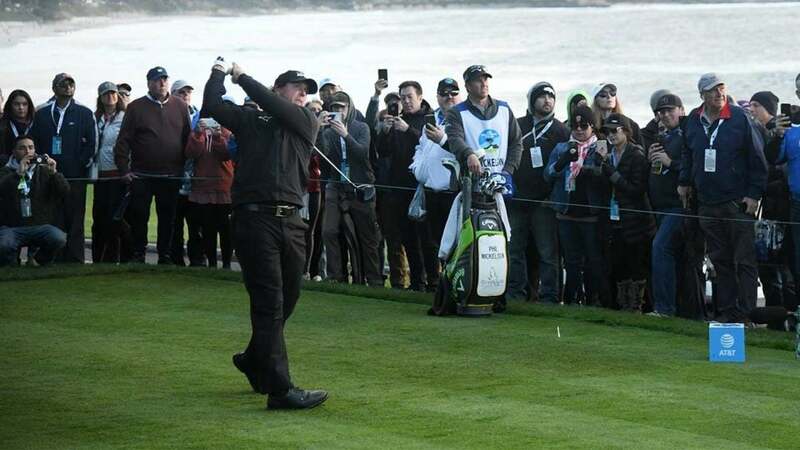 Here’s what you missed at the AT&T Pebble Beach Pro-Am on Sunday. Storms pushed back final round tee times an hour, and hail eventually suspended play later in the morning. The final pairing of Paul Casey and Phil Mickelson were just about to tee off when the second delay hit, and their 10:50 a.m. local tee time (after the first hour delay) was pushed back more than two hours. They eventually hit their opening tee shots at 1:08 p.m. local, knowing there would be little chance for a Sunday finish. Including the initial weather delay, the total suspension lasted about 3 hours and 20 minutes. Casey was the 54-hole leader and held a three-stroke lead over Mickelson heading into Sunday. Both were bogeyless on the front nine, but Mickelson made his third birdie of the day on the par-4 9th, sticking his approach to inside one foot, to get within one at the turn. Mickelson then rolled in an 11-footer on the par-4 10th to tie Casey at 16 under with eight to play. Shortly after Mickelson’s birdie, Scott Stallings signed for a 66 to get in at 15 under, two back of Mickelson, and take the clubhouse lead. Mickelson suddenly led by two when Casey failed to get up and down on 11 and 12 and made back-to-back bogeys, and he made it a three-shot lead with a birdie on 13. They both made birdies on 14, and play was eventually called with two holes to play and Mickelson at 18 under (six under on the day) leading Casey and Scott Stallings by three. Casey will have a 3-footer for par to clean up on 16. Wind chills were in the upper 30s on Sunday and, at around 4 p.m. local, when the sun was setting, temperatures dipped below 50. It felt as cold as the low 40s. Si Woo Kim was among those who were, well, cold. Play will resume at 8 a.m. local (11 a.m. ET). Tickets are free and it will be broadcast live on Golf Channel. Casey, after he finishes on 16, and Mickelson will have the par-3 17th followed by the par-5 18th. Mickelson is looking to win this event for the fifth time, which would tie him with Mark O’Meara for the most in history.